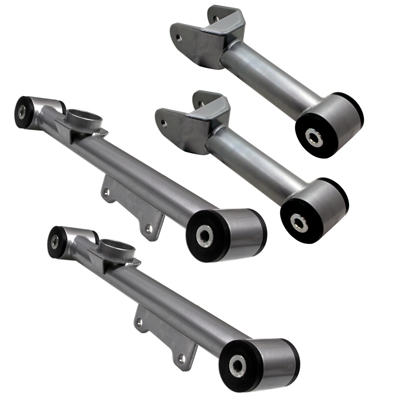 Compare UPRs Chrome Moly control arms to other brands and see why UPR is SIMPLY THE BEST! Chrome Moly construction means the lightest and strongest control arms on the market. Less unsprung weight means quicker response and handling. Utilizes the latest designed urethane bushing package developed and made by Energy Suspensionanother industry leader. Designed to enhance pinion angle for maximum traction and longevity. Includes zerk fittings for easy maintenance when greasing the bushings. Lifetime guarantee-unparalleled in the industry! All of our Suspension Products are made with the Highest Quality materials and most expensive components. We spare no expense on our products and always stand behind them with our Lifetime warranty that no one else offers. Installs in 2 hours with basic hand tools. 1979 1980 1981 1982 1983 1984 1985 1986 1987 1988 1989 1990 1991 1992 1993 1994 1995 1996 1997 1998 1999 2000 2001 2002 2003 2004 LX GT GTS Mustang Cobra* Roush Saleen & Steeda Vehicles. *Will not work on IRS equipped vehicles. No one else can stack up to the bold clean styling of our aftermarket Billet dress ups, Street Strip & Racing Suspension & Performance Parts for your late model American Muscle Car!